Do you use your own test facilities to assist in quantifying the EMC performance of your products? This might be at the development stage, as the precursor to using a third party accredited laboratory or even as the basis for CE Marking. Testing against the requirements of relevant harmonised European standards is the most common way of technically evaluating a product for EMC as part of the CE Marking process. The consequence of unquantified in-house test results, or using or interpreting in-house test results incorrectly can be financially costly, increase the product’s time to market and risk brand reputation. Eurofins York offers an EMC facilities test and measurement review service to help you have confidence in your test results. Many organisations use their own test facilities to assist them in quantifying the EMC performance of their products. These facilities range from very basic set-ups with a functional but limited capability to fully compliant laboratories. We offer a bespoke health check tailored to your facility. Whatever the outcome of your Health Check, Eurofins York can assist in ensuring that there is the maximum confidence in the results obtained from in-house tests and measurements facilities. 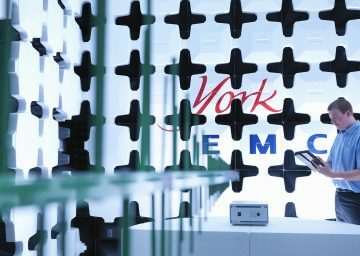 For more information on our EMC facilities, test and measurement review service, or to enquire about having your EMC facilities health checked, please contact the Expert Services team at our York office.